Last week I championed 'patience' as one of the qualities which defines Test cricket. I could have added 'unpredictability'- the ability of a game to change dramatically first one way then the other, within the space of one session or continually over the course of five days. One of the defining features of good Test cricket that is. Sad to say, the action at Lord's and Old Trafford over the past two weeks was nothing if not predictable and anything but good Test cricket. I say 'sadly' for a number of reasons, not the least of which being that Bangladesh deserve better and more sympathetic treatment. As Geoffrey Boycott pointed out repeatedly (to the point of self-caricature), they were totally out of their depth in English conditions, a problem exacerbated by the sterile nature of their home pitches. They had neither the technique to combat the steady if unspectacular English bowling nor, more particularly, the bowlers themselves to exploit the conditions. At their current stage of development, playing two tests in England in late May, no matter how dry the weather, is asking a lot. It proved far too much. A three month tour of England playing county sides and finishing off with a one-off Test in easier conditions at the end of the summer would have been far more beneficial. The current situation leads one to question the ICC strategy towards potential and new test playing countries. It is too easy to say that Bangladesh should never have been awarded Test status. 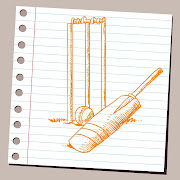 It has had three seriously negative consequences: firstly the reputation of Test cricket has been damaged by unworthy contests; secondly players averages are being artificially inflated with cheap runs and wickets and thirdly and perhaps most importantly rather than being encouraged Bangladesh are suffering humiliation on a regular basis. But it has also been an enormous boost to their cricket and brought great joy to their citizens and supporters both back in 2000 when Test status was granted and over the past ten years. These are not irrelevant considerations. So awarding them Test status was not necessarily a mistake. But doing so without a sufficient 'post-accession' strategy certainly was. One only has to look at the ICC website to see the problem. Emphasis is placed on "closing the gap" between 'affiliate' and 'associate' member countries and the full, test playing nations. The inference being that each country in the latter category has reached some hypothetical minimum standard. Clearly that is not the case. Not only should the ICC create/change its strategy to Bangladesh now but it should also set up clear benchmarks for future countries, covering everything from umpiring to pitch preparation, both prior and after achieving Test status. It is in the interest of everyone concerned with cricket's future that they do so. As a consequence of two no-contests, nothing further was learnt about the form or class of either England or Bangladesh than was garnered during the two tests on the sub-continent. The bowling of Steven Finn was a clear and encouraging exception. His follow-through aside, he appears a more balanced individual than Stuart Broad and with a clearer idea of what sort of bowler he wants to be. There may be room of both of them in the England team, especially with Broad's superior batting, but if I had to predict who was likely to enjoy greater success in Test cricket, my money would be firmly on Finn. 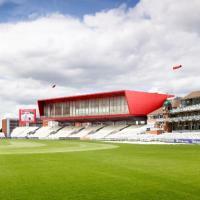 Predictable only to those of us with extensive experience of Old Trafford architecture, is its latest folie des dieux, 'The Point'. 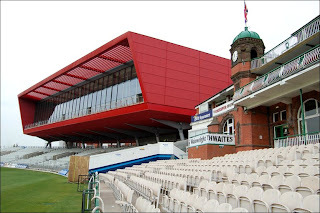 What has always amazed me about Lancashire since I first went to the ground in 1985 is its seemingly endless determination to diminish, at any cost, the appearance of its one memorable landmark - its old, Victorian pavilion. Back in the 80's it was decided that the senior capped players needed a bigger changing room. So an annex was built on the side of the existing pavilion changing rooms. Rather than making some attempt to blend it in to the existing red brickwork (note red is not always a bad idea) the result was what looked like a rather upmarket, semi-permanent, beige port-a-loo. The pavilion's next near-appendage came in 1999 with 'The Lodge', a hotel development of apparently great commercial success, situated behind the seating to the immediate right of the pavilion. Although of more tasteful pallor, cricketing cream, it nevertheless looks exactly what it is: a hotel on a cricket ground. And now the aliens have landed their big, red spaceship on the other side. Shame they forgot to switch on the cloaking device. The Old Trafford Pavilion may not be a thing of great beauty but it does have history. It is the one remaining link to the many glorious games and players to have graced the ground. It deserves to stand alone. Surely the could have stuck this thing on the other side of the ground?